This award winning kitchen is full of designer inspiration! 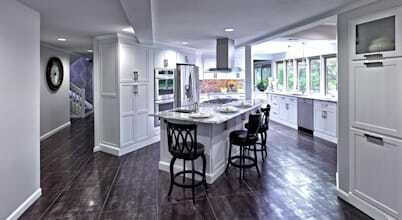 Expert kitchen planners from MAIN LINE KITCHEN DESIGN have created a wonderful kitchen in a Lafayette Hill residence. This dream kitchen boasts of the 2014 Coty Award, sitting pretty in a smart & convenient layout that tastefully incorporates the modular character. Well-lighted, both naturally as well as artificially, this beautifully planned kitchen celebrates plentiful storage and contemporary design for a modern, visually sound and practically poised hearty space. The exquisite yet sober backsplash oozes style as the sturdy sass of stone rings in a humble swank. This black & white kitchen is loaded with utility in every detail; the classic core blends with the modish suggestions to give an alluring personality to this dream kitchen. The ageless chromatic appeal of this black & white kitchen, along with its functional richness, offers some great kitchen inspiration to take home. Have a look! Video of This award winning kitchen is full of designer inspiration! Tags: This Award Winning Kitchen Is Full Of Designer Inspiration!